(Prince George, B.C.) 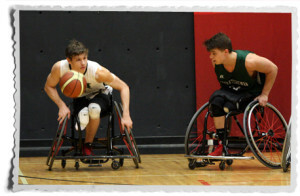 Three-time defending champion Quebec and top-seeded Saskatchewan secured the top spots in their respective pools and will face Prince Edward Island and Alberta, respectively, in the wheelchair basketball semifinals at the 2015 Canada Winter Games in Prince George, B.C. Both semifinal matches are set for Thursday as Quebec (3-0) and P.E.I. (3-1) tip off at3 p.m. PT and Saskatchewan (4-0) faces Alberta (2-1) at 5 p.m. PT. The medal games will take place on Friday, February 20, 2015. Host team British Columbia (1-3), Manitoba (0-4), New Brunswick (1-2), Nova Scotia (0-3) and Ontario (2-2) will compete in the consolation playoffs to determine their final placement at the tournament. Team Ontario picked up its first win at the 2015 Canada Games with a 56-27 triumph over winless Manitoba. Ontario converted on its first possession en route to a 28-14 advantage at halftime. The Manitoba bench erupted as multiple players on the young squad hit the scoreboard. Team Toba has steadily improved and delivered its most complete game of the tournament to date. Aaron McDonald, of Hamilton, Ont., led all Team Ontario players with 13 points. Kurtis Wiens, of LaSalle, Man., scored a team-high 8 points for Manitoba. Quebec set the tone early with its speed and aggressive defense, as it started the game on a 7-0 run. Alberta shook off the slow start and responded to narrow the gap to 13-10 after one quarter of play. The intensity continued in the second frame, with Quebec ultimately widening the deficit to 32-25 at halftime. Team Quebec carried the momentum over into the second half, out chancing Alberta down the stretch to secure the win. With the victory Quebec seized the top spot in Pool A to end the preliminary round. Benjamin Palmer, of Laval, once again drove the Quebec offense with 23 points. Ben Moronchuk, of Edmonton, delivered 21 points for the Alberta side. Despite the loss to Quebec, Alberta head coach Darrell Nordell said his team’s confidence going into the semifinals is still very high. Team Saskatchewan went undefeated in preliminary round play and locked up first place in Pool B courtesy of an 84-51 win over Prince Edward Island. The Team P.E.I. struggled to capitalize on their opportunities, shooting 28.6 per cent from field goal range. The P.E.I. defense also could not contain Regina native Nik Goncin, who scored the triple-double for Saskatchewan with 31 points, 23 rebounds and 19 assists. Liam Hickey, of St. John’s, N.L., picked up the double-double for P.E.I. on the strength of 25 points and 11 rebounds. With both teams in search of their first win, New Brunswick poured the pressure on early and outscored Nova Scotia 31-5 in the opening quarter. Nova Scotia settled in and found its scoring touch in the second quarter, but Team N.B. continued the onslaught to take the 48-17 lead at halftime. New Brunswick was efficient on both sides of the ball, converting on turnovers and limiting Nova Scotia to 14 points in the second half. Saint John natives Jacob Fudge and Sean Wilson scored 21 and 20 points, respectively, for Team New Brunswick. Nova Scotia players Jason Drost, of Hammonds Plains, Joel Goswell, of Truro, and Ben Power, of Cole Harbour, had six points apiece. Team Ontario kept the momentum rolling to pick up its second win in less than 12 hours with a decisive victory over Team B.C. Ontario got off to a hot start by opening the game on a 17-0 run, and led 17-2 at the end of the first quarter. Host British Columbia rebounded in the second quarter, outscoring Ontario 12-11 in the frame. The tide turned for good in the third quarter, as Ontario put up 19 points while Team B.C. went scoreless. Eric Voss, of St. Mary’s, Ont., scored a team-high 19 points for Ontario. Prince George native Avril Harris led all B.C. players with nine points and 15 rebounds. Team P.E.I. punched its ticket to the semifinals with a convincing 65-20 win over Team Manitoba to conclude the preliminary round. Prince Edward Island finished in second place in Pool B. P.E.I. upped the tempo in the opening quarter and kept the pedal down en route to a 39-8 lead at halftime. Liam Hickey, of St. John’s, N.L., was once again offensive juggernaut for the P.E.I. side. He scored 27 points. Kurtis Wiens, of LaSalle, Man. led the offensive charge for Team Manitoba with eight points.